Let me start by saying that there is relatively little that I fear. I have been an adventuresome woman for quite awhile. I used to ride dirt bike occasionally with my cousins. Then, my husband introduced me to it again when in my 20's. I loved trail riding and did my best to keep up with the men. I had no women to ride with. After 15 years of this we found it was getting harder to find the time and places to trail ride. I had always wanted to street ride but my husband was against it because he had ridden for a number of years before we met and was hit a couple of times. However, his best friend kept after him and in May 2011 my husband bought a street bike. Well, I certainly didn't want to be a passenger so he had to get one for me. 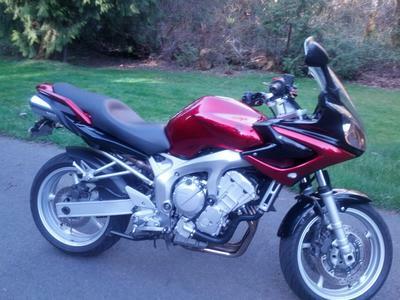 By June 2011 I settled on a 2004 FZ6. I was so excited to get started. I planned on taking a MSC to get my endorsement, but I just HAD TO give it a spin before that was going to happen. You know..."just take it around the block." After all, we live in a semi-rural area. Long-story-short: Crashed it into a guardrail going 35-40 mph. Clearly, I didn't know what I was doing. Broke my jaw in 2 places, shattered my wrist, three surgeries, and a neck, shoulder and arm that still require therapy. A lot of friends and family (especially my parents)didn't want me to ride again. Nine months after the crash I got on as a passenger. Scariest ride ever!! I was not expecting to feel such fear and fragility. I sobbed the entire ride. BUT I KNEW I HAD TO CONQUER THE FEAR! A month later my 16 year old son and I took the MSC and got our endorsements. Summer of 2012 I put on nearly 2,000 miles. I still have a certain degree of fear that most riders who have not been in a major accident feel. So, for me, I know I HAVE TO RIDE so as to not let the fear conquer me. Hi...so proud of you! Fear can be overwhelming! I know i let fear keep me from riding so many times! I have never crashed...but my husband has and his stories have left me in so much self doubt!! I love riding and the few times i go out are the best...i am trying very hard to get my confidence up and not let fear rule my life! Thankyou for your post! Have a happy and safe summer!